Faith Goldy's public talk at Wilfrid Laurier University, which attracted over 175 attendees, was cancelled because someone pulled a fire alarm. More than 175 people lined up at Paul Martin Centre in Waterloo, Ont., to see her speak about keeping Canada's borders closed to immigration. More than 100 people protested outside the centre, yelling "shame" and "no Nazis at Laurier!" as the event was about to take place. The talk was set to start at 7:15 p.m. ET. At approximately 7:20 p.m, a fire alarm was pulled and police evacuated the building, preventing anyone from entering the Paul Martin Centre. Event attendees then moved to Veterans' Green park, on the other side of campus, where Lindsay Shepherd, the organizer of the event, announced the talk was cancelled. Shepherd, the co-founder of the campus group Laurier Society for Open Inquiry, said she's "super disappointed" at the outcome. According to Goldy's Twitter account, the fire alarm was pulled before she was even introduced and presented on stage. 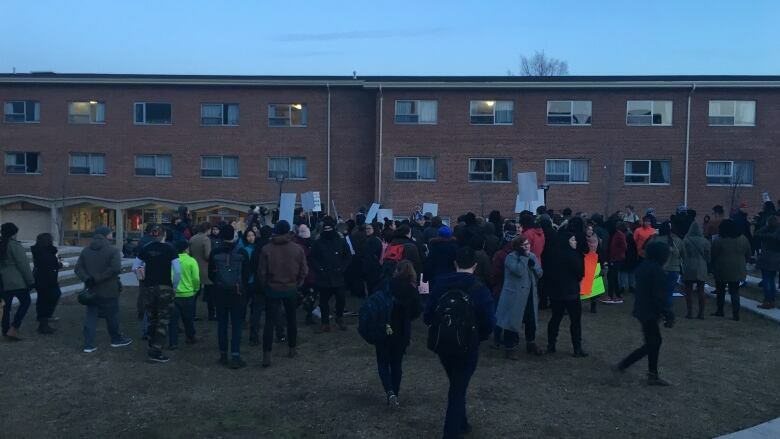 "My view of these college leftists is more damaged than it used to be," Shepherd said to CBC News, assuming the person who pulled the fire alarm was someone who opposed the talk. "I had faith that we'd have a nuanced discussion where people can challenge the speaker at the end — obviously that was too much to hope for," said Shepherd. More than 175 people wanted to attend Goldy's talk, which extended the room's capacity. Shepherd said she had to turn away an additional hundred. Goldy was let go from her job at Rebel Media after appearing on a podcast affiliated with the neo-Nazi website the Daily Stormer. Her planned talk at the Waterloo university — "Ethnocide: Multiculturalism and European Canadian Identity" — drew polarizing responses, including criticism from outspoken professors at the university who called on administration to prohibit it and for students to tear down posters with Goldy's face. Protesters said providing her with a platform makes students of colour feel unsafe. 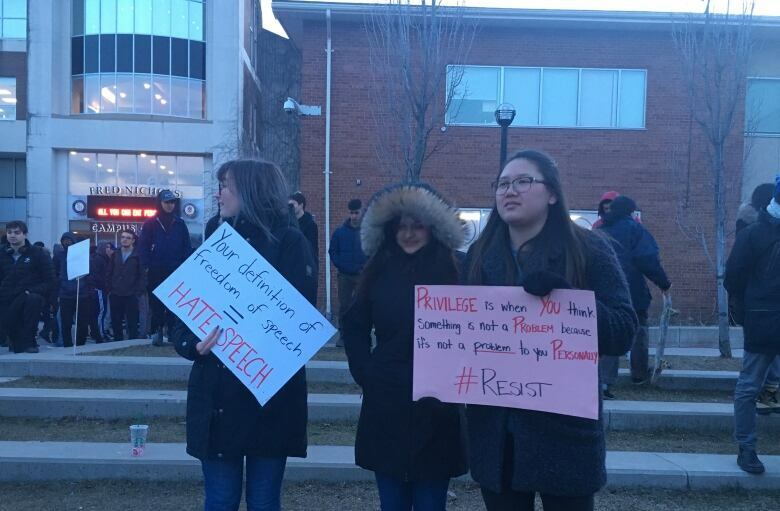 The crowds protesting outside the Paul Martin Centre Tuesday chanted "black and Indigenous lives matter." "Wilfrid Laurier University has determined that our lives do not matter here," said Fanis Juma Radstake, who represents the African Community Wellness Initiative on campus. "They acted as a gateway for violent white supremacists to have access to our children and youth," Radstake said. Goldy on Twitter thanked Shepherd and said she will be back. Shepherd said the turn of events makes her feel motivated to keep organizing controversial talks. "We'll have more of the unpopular speaker series. We are committed to having her back," said Shepherd. "We saw how much interest there was. Frankly the room was not big enough."